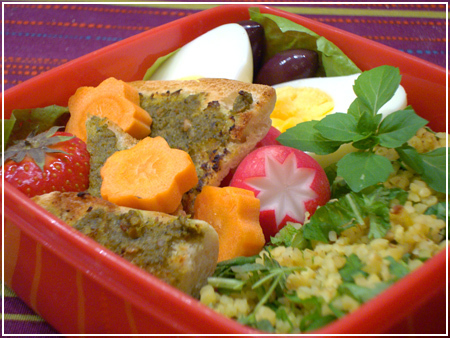 A bag of mixed pickles from the weekend – hardboiled egg, bulgur with fresh herbs, radish, toasted flatbread pieces with pesto on top, carrot flowers, olives and a strawberry on lettuce. 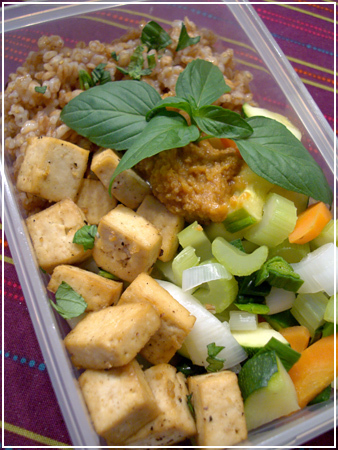 Another bento which I will stash in the office freezer for an emergency: baked tofu cubes, steamed veggies, parboiled wheat with raisins and satay sauce. 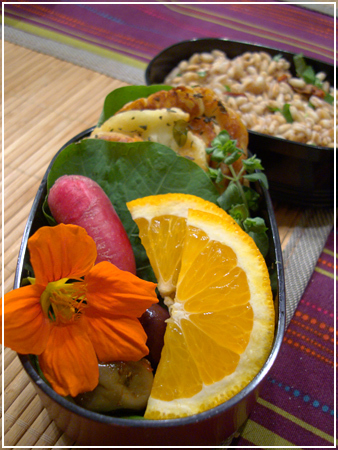 It’s vegan but still quite a power lunch! 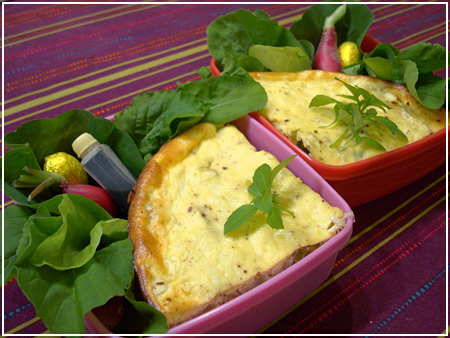 Bulgur and leek “quiche” on a bed of homegrown rucola and cress, radish, bottle of vinegar and an easter candy for dessert. The main attraction is something I made up on the spot based on “Hmm, I feel like something quiche/pizza-y” and “But I am too hungry to wait for dough to rise!”. So instead of dough, I made some bulgur in the bottom of a pie pan, put leek (fried in a dab of butter and white wine) on top and topped the whole thing with an egg-yoghurt mixture before tossing it in the oven. It’s quite tasty but I underestimated the amount of bulgur I had put in, and overestimated the egg. 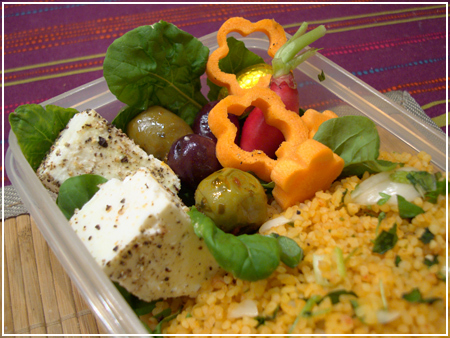 Next time I think I will mix it all together before baking as the bulgur on the bottom was a bit dry on its own. Ah well, you just keep on trying (until you run out of cake)! 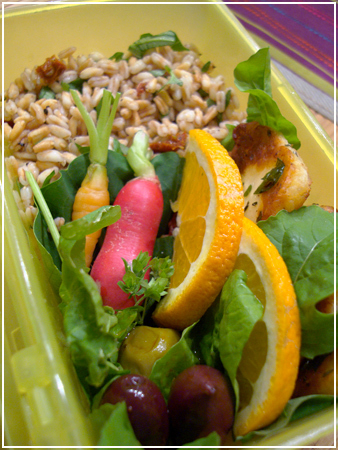 BF’s box – Dinkel wheat with sundried tomatoes and herbs, a tiny homegrown carrot and a huge homegrown radish, olives, orange slices and halloumi on a bed of rucola and Nasturtium leaves. My own box – I didn’t dare taking another carrot yet so I have a flower instead. 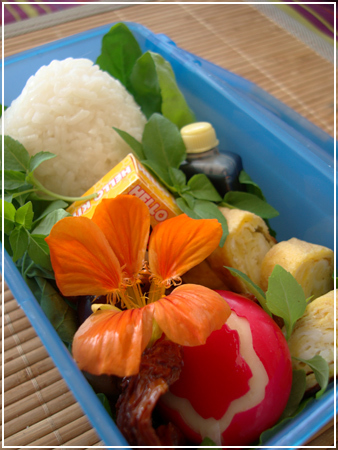 Onigiri, Hello Kitty dried fruit box, tamagoyaki, babybel cheese, sundried tomatoes, olives and a Nasturtium* flower on a bed of rucola and small-leaf basil. In the meanwhile, have a status update of this spring’s plants and flowers!